Solar energy installations are extremely reliable, but like any piece of equipment with an expected life span of more than 30 years, they need to be well maintained. A customized Operations and Maintenance (O&M) plan that suits the needs of the asset managers, owners, and investors ensures the highest performance levels throughout the systems life cycle. However, not all O&M agreements are alike. Once a solar array is commissioned, the work is not over. Although solar installations are very reliable, as with any piece of equipment with a life span of three decades or more, they need to be well maintained. Customized O&M packages that suit customers’ needs are key to providing a cost effective and efficient solution to ensure a renewable energy system is at optimal performance. Done right, not only do O&M service agreements preserve all asset warranties provided by manufacturers, suppliers, or contractors, they also ensure optimal performance of the assets and minimize variable costs of operation as well as wear and tear on the assets. Asset manager risk losing warranties from the Original Equipment Manufacturers (OEMs) if their O&M service provider fails to properly maintain the systems according to OEMs’ warranty requirements. Proper cleaning methods for modules, as directed by OEMs is required as well as regular preventative maintenance for the inverters, trackers and the Balance of System (BoS). Depending on the environment, dust accumulation varies causing financial losses for operators. Installed modules may collect a light layer of dust and dirt over time; however, for most installations, rainfall is usually sufficient to remove any soiling. Solar cell manufacturers do recommend the cleaning of panels at least once a year, although in some extremely dusty environments, more frequent cleaning is necessary. 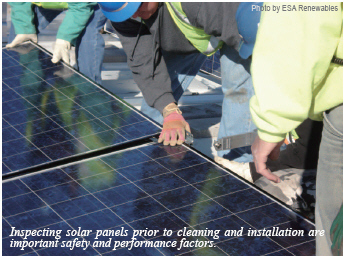 Proper care must be used when cleaning the modules on a solar array. Cleaning activities create risk of damage to the modules and array components, as well as increase the potential for electric shock. Before any cleaning procedure, an O&M service provider should inspect modules thoroughly inspected for cracks, damage and loose connections. Although the encapsulating glass of most modules provide insulating protection from electrical shock hazard when the glass is fully intact, in the unlikely event that the glass is cracked or if the glass is damaged during the cleaning operation, a conductive path may be created. Because cracked or broken panels represent a shock hazard due to leakage currents, the risk of shock is increased when the modules are wet. Additionally, the voltage and current present in an array during daylight hours are sufficient to cause a lethal electrical shock. In general, modules should be cleaned only when in open circuit, either disconnected from the load, or during times when the inverter is turned off. Proper use of automated or motorized cleaning tools and methods or those cleaning fixtures or tools which are supported by or rest on the modules must meet manufacturers specifications to ensure warranty coverage. When using a wet cleaning method, tap water, with low mineral content, or de-ionized water may be used. If needed, a mild, non-abrasive, non-caustic detergent may be used as well. However, using abrasive cleaners or degreasers to clean the modules is usually not recommended or permitted according to most OEMs module cleaning procedures. To avoid damage to the module, water should not be more than 68° Fahrenheit warmer or colder than the module surface temperature and maximum water pressure used should not exceed 500 psi. Also, care should be taken to avoid cleaning or spraying water at the junction box and the backside of the module. When using a dry or brush cleaning method, the brush, sponge or other mild agitating tools generally may be used with caution. They should not be made of abrasive material which can damage the glass. Additionally, the dry cleaning tool should be constructed with non-conductive materials to minimize risk of electric shock. 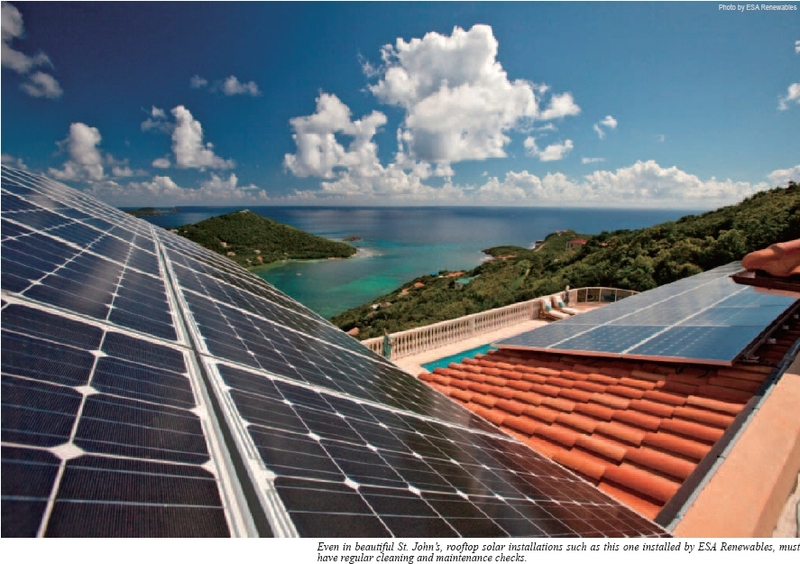 Damage to a PV system can be caused by the sun, the wind, hailstones, animals, and/or people. 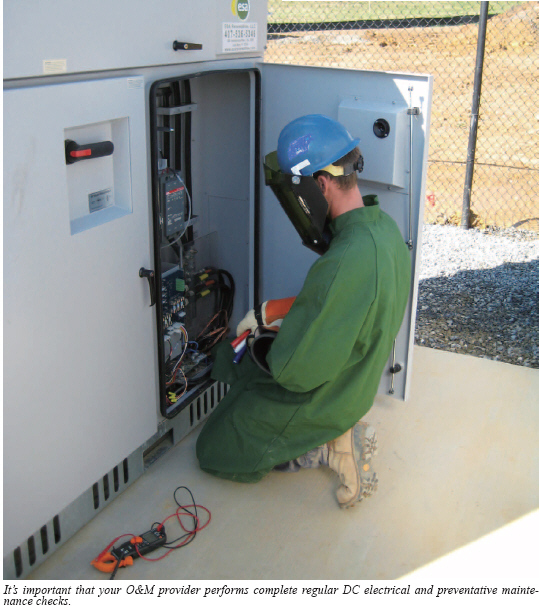 It’s important that your O&M provider performs regular DC electrical and preventative maintenance checks. O&M service teams perform a comprehensive list of services, based on quarterly, bi-annual and annual schedules including the required preventative maintenance for OEM warranties. These preventive maintenance tasks include inverters, modules, trackers and BOS─calibration, software and system upgrades, thermal scans, etc. The purpose of these system checks is to predict failures, maintain equipment and ensure the power plant is operating at optimum efficiency levels. Monitoring a renewable energy system regularly is as important as the design and construction phases of a solar installation. A Monitoring System allows proper tracking of solar power production through a customized web-based interface. 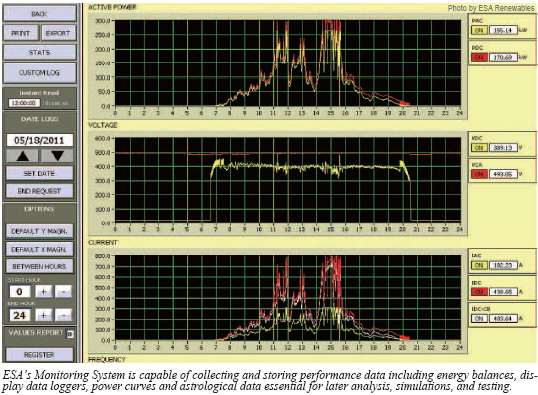 Capable of collecting and storing performance data including energy balances, display data loggers, power curves and astrological data essential for later analysis, simulations, and testing it is an effective tool for use in the preventive and corrective maintenance as well as trending projections. Providing a simplified, centralized, reliable and secure data management system, this type of turnkey industrial solution grants immediate access, from anywhere in the world, to pertinent, real-time and historic data. A key part of an O&M solution, a Monitoring System also provides automatic, fault alerts to system managers allowing for quick response and minimal operational losses. Without a Monitoring System, failures or problems can go unnoticed for extended periods of time resulting in lost energy and revenues. For solar asset managers controlling the ongoing cost of operating and maintaining solar assets over the lifetime of their installation is key to maintaining acceptable ROI standards for the Photovoltaic (PV) assets as well as maintaining an attractive Internal Rate of Return (IRR) to investors. Not only do asset managers account for O&M costs upfront and operate within a budget, but they must also project the risk of major failures of systems, especially inverters. There’s a serious risk of potential cost overrun due to unforeseen failures, repairs, replacement, and downtime. A new module for Monitoring Systems enables users to track cost expenditures such as labor hours, travel, materials, and any other costs associated with maintenance. This newly released module allows the Monitoring System operator to generate work orders from anomaly alerts, track specific costs to that work order, and create trend projections for future costs and energy production values based on historic trends. With a Power Production Guarantee Program as part of an O&M agreement, project owners, lenders and investors minimize project risks and protect balance sheets from any potential losses which in-turn enhances a project’s fundability and accelerates deal flow and closing. This type of program is relatively new and guarantees specific monthly energy production for solar energy generating systems. With this new Power Production Agreement, should the photovoltaic system fail to meet anticipated power production levels, the O&M company will pay the solar farm owners the difference between projected and actual energy generated. To determine future production levels, the O&M provider visits each individual solar farm and performs a complete audit and analysis of current and historic data including energy production levels, panel and inverter compatibility, ratios, high efficiencies, tilt of panels and weather variants. After charting projected production levels, the O&M provider will sign into a guarantee with the facility owners to meet these expectations. Should a system fail to reach projected levels, for any reason, the O&M provider will pay the renewable energy plant owners the variance between the two numbers based on a set cost per kilowatt hour (kWh). Customized operations and maintenance packages offer customers a cost-effective and efficient way to keep their renewable energy systems at optimal performance levels. For solar farm owners that do not have the staff on site to maintain the installation, a turnkey solar solutions provider, such as ESA Renewables, LLC (ESA), offers O&M contracts customized to each solar farms needs. Maureen McHale is Marketing Consultant with ESA Renewables (http://esarenewables.com). Located in Central Florida, the U.S.A., McHale has been actively promoting the solar industry and green products for the past five years.